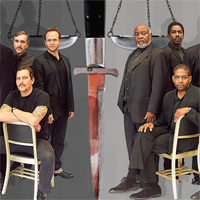 In Reginald Rose’s play Twelve Angry Men, jurors must deliberate the fate of an unseen defendant on trial for murder. In Sheldon Epps’ new production at the Pasadena Playhouse, there’s an equal amount of discussion taking place after the show is over. Which was precisely his goal. The core of Epps’ vision for the production included making six of the men black and the other six white. The show begins with only one juror considering the innocence of the defendant. One by one, he slowly convinces the others to do the same. “I thought that the tension, underlying or overt, would be an interesting dynamic. I did go back and forth a long time before I cast the play,” Epps says.